StarbucksStarbucks’ Pumpkin Spice Latte marks the beginning of fall for many people. 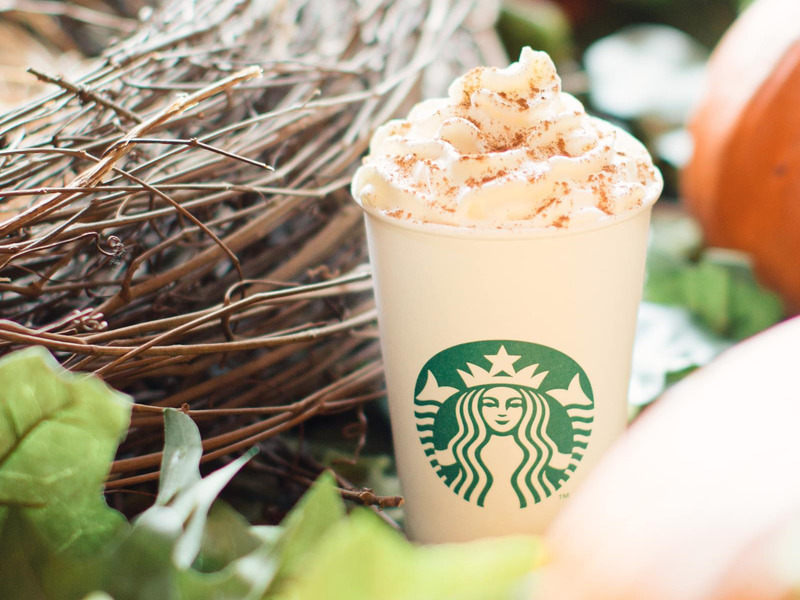 Starbucks’Pumpkin Spice Latte will debut on August 28, according to internal documents viewed by Business Insider. An August 28 launch date marks a slightly earlier debut than usual, with the drink becoming available to select customers on September 1 last year and to all customers on September 5. 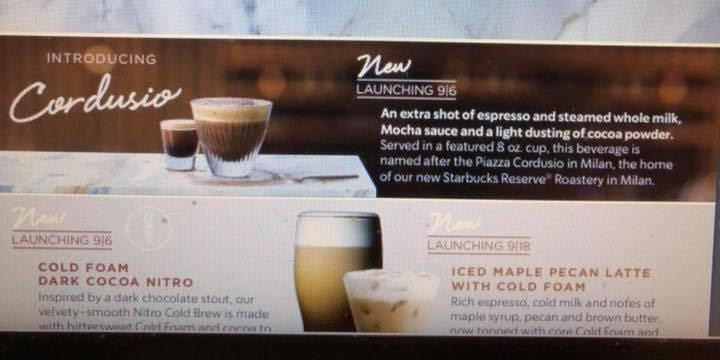 Starbucks is also adding new drinks to the fall menu: the espresso-based Cordusio and two new cold drinks, the Cold Foam Dark Cocoa Nitro and the Iced Maple Pecan Latte with Cold Foam. Starbucks’Pumpkin Spice Latte season is kicking off early in 2018. Earlier this week, Business Insider reported that PSL fans were theorizing that Starbucks would begin serving the Pumpkin Spice Latte on August 28. Employees said PSL supplies had already arrived in stores and began posting photos as evidence online. Now, Business Insider has proof of the August 28 launch date. 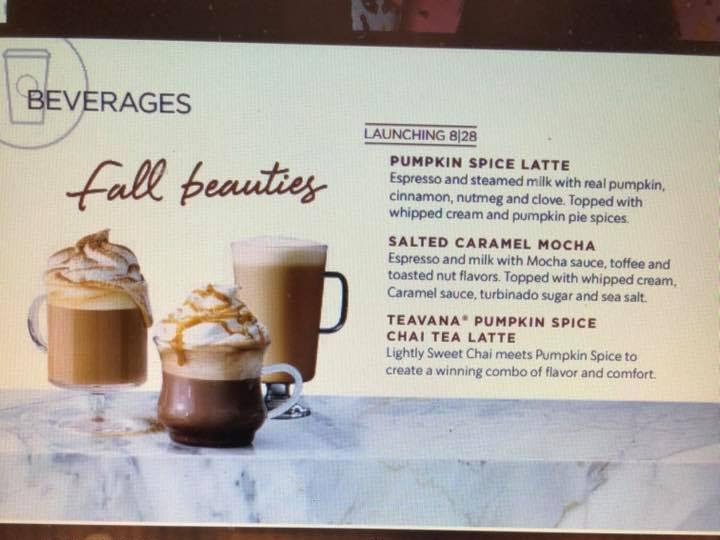 An internal announcement of Starbucks’ fall menu shows that the PSL’s triumphant return is scheduled for August 28, the Tuesday before Labour Day weekend. The documents show that in addition to the PSL, Starbucks also plans to bring back the Salted Caramel Mocha and the Teavana Pumpkin Spice Chai Tea Latte, which was first introduced last year, on August 28. The fall menu shared with Business Insider also teases two new offerings launching in September. The espresso-mocha Cordusio is named after the new Starbucks Reserve Roastery in Milan. And, as cold drinks become a larger part of Starbucks’ year-round business, the coffee giant is introducing two new chilled fall drinks: the Cold Foam Dark Cocoa Nitro and the Iced Maple Pecan Latte with Cold Foam. 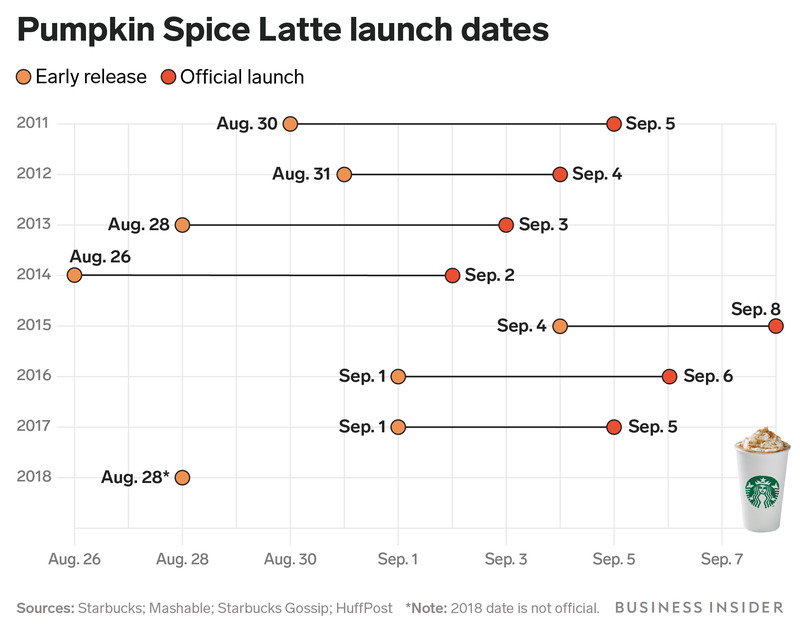 An August 28 launch date for the Pumpkin Spice Latte is on the earlier side of when the seasonal beverage typically debuts. The earliest Pumpkin Spice Latte launch was in 2014, when Starbucks released the drink to select customers on August 26, with the general public getting access to the drink on September 2. Last year, the PSL’s early release date was September 1, with the official launch coming September 5.